Plutonium (94Pu) is an artificial element, except for trace quantities resulting from neutron capture by uranium, and thus a standard atomic weight cannot be given. Like all artificial elements, it has no stable isotopes. It was synthesized long before being found in nature, the first isotope synthesized being 238Pu in 1940. Twenty plutonium radioisotopes have been characterized. The most stable are Pu-244, with a half-life of 80.8 million years, Pu-242, with a half-life of 373,300 years, and Pu-239, with a half-life of 24,110 years. All of the remaining radioactive isotopes have half-lives that are less than 7,000 years. This element also has eight meta states, though none are very stable; all meta states have half-lives of less than one second. The isotopes of plutonium range in atomic weight from 228.0387 u (Pu-228) to 247.074 u (Pu-247). The primary decay modes before the most stable isotope, Pu-244, are spontaneous fission and alpha emission; the initial mode after is beta emission. The primary decay products before Pu-244 are isotopes of uranium and neptunium (neglecting the wide range of daughter nuclei created by fission processes), and the primary products after are isotopes of americium. Plutonium-238 has a half-life of 87.74 years and emits alpha particles. Pure Pu-238 for radioisotope thermoelectric generators that power some spacecraft is produced by neutron capture on neptunium-237 but plutonium from spent nuclear fuel can contain as much as a few percent of Pu-238, from either 237Np, alpha decay of 242Cm, or (n,2n) reactions. Plutonium-239 is the most important isotope of plutonium, with a half-life of 24,100 years. Pu-239 and Pu-241 are fissile, meaning that the nuclei of its atoms can break apart by being bombarded by slow moving thermal neutrons, releasing energy, gamma radiation and more neutrons. It can therefore sustain a nuclear chain reaction, leading to applications in nuclear weapons and nuclear reactors. Pu-239 is synthesized by irradiating uranium-238 with neutrons in a nuclear reactor, then recovered via nuclear reprocessing of the fuel. Further neutron capture produces successively heavier isotopes. Plutonium-240 has a high rate of spontaneous fission, raising the background neutron radiation of plutonium containing it. Plutonium is graded by proportion of Pu-240: weapons grade (< 7%), fuel grade (7–19%) and reactor grade (> 19%). Lower grades are less suited for nuclear weapons and thermal reactors but can fuel fast reactors. Plutonium-241 is fissile, but also beta decays with a half-life of 14 years to americium-241. Plutonium-242 is not fissile, not very fertile (requiring 3 more neutron captures to become fissile), has a low neutron capture cross section, and a longer half-life than any of the lighter isotopes. Plutonium-244 is the most stable isotope of plutonium, with a half-life of about 80 million years. It is not significantly produced in nuclear reactors because Pu-243 has a short half-life, but some is produced in nuclear explosions. A pellet of plutonium-238, glowing from its own heat, used for radioisotope thermoelectric generators. Transmutation flow between 238Pu and 244Cm in LWR. Transmutation speed not shown and varies greatly by nuclide. 245Cm–248Cm are long-lived with negligible decay. Pu-239, a fissile isotope that is the second most used nuclear fuel in nuclear reactors after U-235, and the most used fuel in the fission portion of nuclear weapons, is produced from U-238 by neutron capture followed by two beta decays. Pu-240, Pu-241, Pu-242 are produced by further neutron capture. The odd-mass isotopes Pu-239 and Pu-241 have about a 3/4 chance of undergoing fission on capture of a thermal neutron and about a 1/4 chance of retaining the neutron and becoming the following isotope. The even-mass isotopes are fertile material but not fissile and also have a lower overall probability (cross section) of neutron capture; therefore, they tend to accumulate in nuclear fuel used in a thermal reactor, the design of nearly all nuclear power plants today. In plutonium that has been used a second time in thermal reactors in MOX fuel, Pu-240 may even be the most common isotope. All plutonium isotopes and other actinides, however, are fissionable with fast neutrons. Pu-240 does have a moderate thermal neutron absorption cross section, so that Pu-241 production in a thermal reactor becomes a significant fraction as large as Pu-239 production. Pu-241 has a half-life of 14 years, and has slightly higher thermal neutron cross sections than Pu-239 for both fission and absorption. 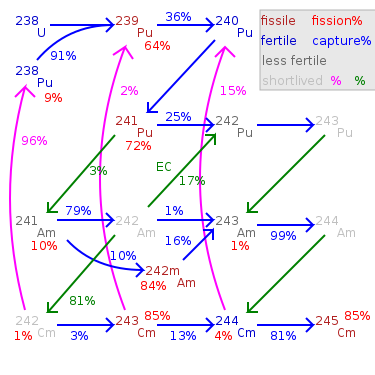 While nuclear fuel is being used in a reactor, a Pu-241 nucleus is much more likely to fission or to capture a neutron than to decay. Pu-241 accounts for a significant proportion of fissions in thermal reactor fuel that has been used for some time. However, in spent nuclear fuel that does not quickly undergo nuclear reprocessing but instead is cooled for years after use, much or most of the Pu-241 will beta decay to americium-241, one of the minor actinides, a strong alpha emitter, and difficult to use in thermal reactors. Pu-242 has a particularly low cross section for thermal neutron capture; and it takes three neutron absorptions to become another fissile isotope (either curium-245 or Pu-241) and fission. Even then, there is a chance either of those two fissile isotopes will fail to fission but instead absorb a fourth neutron, becoming curium-246 (on the way to even heavier actinides like californium, which is a neutron emitter by spontaneous fission and difficult to handle) or becoming Pu-242 again; so the mean number of neutrons absorbed before fission is even higher than 3. Therefore, Pu-242 is particularly unsuited to recycling in a thermal reactor and would be better used in a fast reactor where it can be fissioned directly. However, Pu-242's low cross section means that relatively little of it will be transmuted during one cycle in a thermal reactor. Pu-242's half-life is about 15 times as long as Pu-239's half-life; therefore it is 1/15 as radioactive and not one of the larger contributors to nuclear waste radioactivity. 242Pu's gamma ray emissions are also weaker than those of the other isotopes. Pu-243 has a half-life of only 5 hours, beta decaying to americium-243. Because Pu-243 has little opportunity to capture an additional neutron before decay, the nuclear fuel cycle does not produce the extremely long-lived Pu-244 in significant quantity. Pu-238 is not normally produced in as large quantity by the nuclear fuel cycle, but some is produced from neptunium-237 by neutron capture (this reaction can also be used with purified neptunium to produce Pu-238 relatively free of other plutonium isotopes for use in radioisotope thermoelectric generators), by the (n,2n) reaction of fast neutrons on Pu-239, or by alpha decay of curium-242, which is produced by neutron capture from Am-241. It has significant thermal neutron cross section for fission, but is more likely to capture a neutron and become Pu-239. The fission cross section for 239Pu is 747.9 barns for thermal neutrons, while the activation cross section is 270.7 barns (the ratio approximates to 11 fissions for every 4 neutron captures). The higher plutonium isotopes are created when the uranium fuel is used for a long time. For high burnup used fuel, the concentrations of the higher plutonium isotopes will be higher than the low burnup fuel that is reprocessed to obtain weapons grade plutonium. Plutonium-239 is one of the three fissile materials used for the production of nuclear weapons and in some nuclear reactors as a source of energy. The other fissile materials are uranium-235 and uranium-233. Plutonium-239 is virtually nonexistent in nature. It is made by bombarding uranium-238 with neutrons in a nuclear reactor. Uranium-238 is present in quantity in most reactor fuel; hence plutonium-239 is continuously made in these reactors. Since plutonium-239 can itself be split by neutrons to release energy, plutonium-239 provides a portion of the energy generation in a nuclear reactor. A ring of weapons-grade electrorefined plutonium, with 99.96% purity. This 5.3 kg ring is enough plutonium for use in an efficient nuclear weapon. The ring shape is needed to depart from a spherical shape and avoid criticality. There are small amounts of Pu-238 in the plutonium of usual plutonium-producing reactors. However, isotopic separation would be quite expensive compared to another method: when a U-235 atom captures a neutron, it is converted to an excited state of U-236. Some of the excited U-236 nuclei undergo fission, but some decay to the ground state of U-236 by emitting gamma radiation. Further neutron capture creates U-237, which has a half-life of 7 days and thus quickly decays to Np-237. Since nearly all neptunium is produced in this way or consists of isotopes that decay quickly, one gets nearly pure Np-237 by chemical separation of neptunium. After this chemical separation, Np-237 is again irradiated by reactor neutrons to be converted to Np-238, which decays to Pu-238 with a half-life of 2 days. Pu-240 undergoes spontaneous fission as a secondary decay mode at a small but significant rate. The presence of Pu-240 limits the plutonium's use in a nuclear bomb, because the neutron flux from spontaneous fission initiates the chain reaction prematurely, causing an early release of energy that physically disperses the core before full implosion is reached. This prevents most of the core from participation in the chain reaction and reduces the bomb's power. Plutonium consisting of more than about 90% Pu-239 is called weapons-grade plutonium; plutonium from spent nuclear fuel from commercial power reactors generally contains at least 20% Pu-240 and is called reactor-grade plutonium. However, modern nuclear weapons use fusion boosting, which mitigates the predetonation problem; if the pit can generate a nuclear weapon yield of even a fraction of a kiloton, which is enough to start deuterium-tritium fusion, the resulting burst of neutrons will fission enough plutonium to ensure a yield of tens of kilotons. Pu-240 contamination is the reason plutonium weapons must use the implosion method. Theoretically, pure Pu-239 could be used in a gun-type nuclear weapon, but achieving this level of purity is prohibitively difficult. Pu-240 contamination has proven a mixed blessing to nuclear weapons design. While it created delays and headaches during the Manhattan Project because of the need to develop implosion technology, those very same difficulties are currently a barrier to nuclear proliferation. Implosion devices are also inherently more efficient and less prone to accidental detonation than are gun-type weapons. ^ Makhijani, Arjun; Seth, Anita (July 1997). "The Use of Weapons Plutonium as Reactor Fuel" (PDF). Energy and Security. Takoma Park, MD: Institute for Energy and Environmental Research. Retrieved 4 July 2016. ^ Sasahara, Akihiro; Matsumura, Tetsuo; Nicolaou, Giorgos; Papaioannou, Dimitri (April 2004). "Neutron and Gamma Ray Source Evaluation of LWR High Burn-up UO2 and MOX Spent Fuels". Journal of Nuclear Science and Technology. 41 (4): 448–456. doi:10.3327/jnst.41.448. Archived from the original on 2010-11-19. ^ "Plutonium Isotopic Results of Known Samples Using the Snap Gamma Spectroscopy Analysis Code and the Robwin Spectrum Fitting Routine" (PDF).